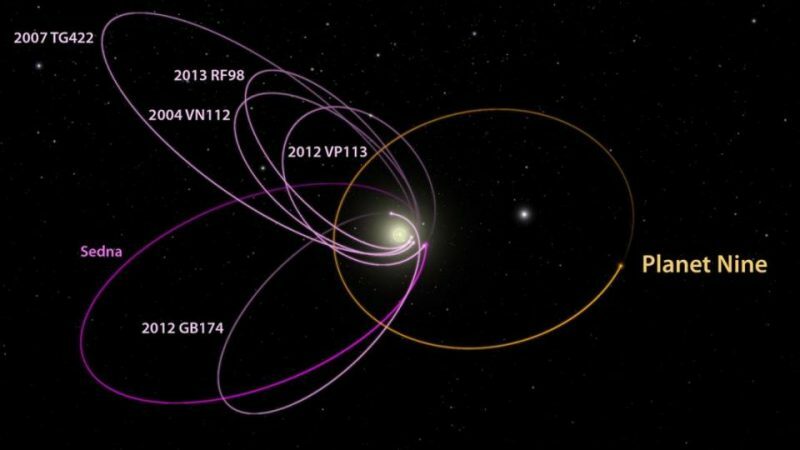 In January 2016 Caltech astronomers publicly theorized existence of a behemoth ninth planet orbiting the Sun. Observations of orbital anomalies in the Kuiper Belt (a massive ring of cosmic debris extending beyond Neptune – home to once a planet Pluto and estimated 100,000 neighbors measuring over 100 Km ) hypothesized a yet to be discovered gargantuan mass was responsible for peculiar behavior of Kuiper Belt residents. In theory a planetary mass ten times greater than Earth, completes an elongated orbit a thousand times farther from the Sun once every 15-20 thousand years – astronomers dubbed it Planet 9. This diagram show the orbits of several Kuiper Belt objects that were used to infer the existence of Planet 9. Image via ASU. Contrary to conspiracy, alien, biblical and doomsday jibber-jabber, no proof of Planet 9 exists – science has a theory based on seven years of sky maps courtesy the WISE space telescope (see link below). Launched in 2009, WISE was designed to detect low level infrared light, light emissions consistent with planets. WISE buckled down – over 750 million curious infrared light sources later, science needs our help. “We need your help searching for new objects at the edges of our solar system. In this project, we’ll ask you to help us distinguish real celestial objects from image artifacts in data from NASA’s Wide-field Infrared Survey Explorer (WISE) mission. The real objects are brown dwarfs and low-mass stars, the Sun’s nearest neighbors. You may find an object closer than Proxima Centauri (the closest star to the Sun) or even discover the Sun’s hypothesized ninth planet, which models suggest might appear in these images. Backyard Worlds needs fresh eyes and plenty of them. Science doesn’t care who you are, what you do or if Kuiper Belt sounds like a foreign language – science needs help. Participants whose efforts lead to discovery will be given full credit. What are you waiting for? Join the search for Planet 9. A previously cataloged brown dwarf named WISE 0855-0714 shows up as a moving orange dot (upper left) in this loop of WISE images spanning 5 years. By viewing movies like this, anyone can help discover more brown dwarfs or even a 9th planet. Image via ASU/ NASA/WISE. This entry was posted in Space and tagged Backyard Worlds, Help Find Planet 9, Kuiper Belt, NASA, Planet 9, space, WISE Space Telescope, Zooniverse. Bookmark the permalink. Isn’t this the fabled Nemisis? Way beyond my ken….. fascinating but it’s all “magic” to me. Of the stronger powers of my imagination.